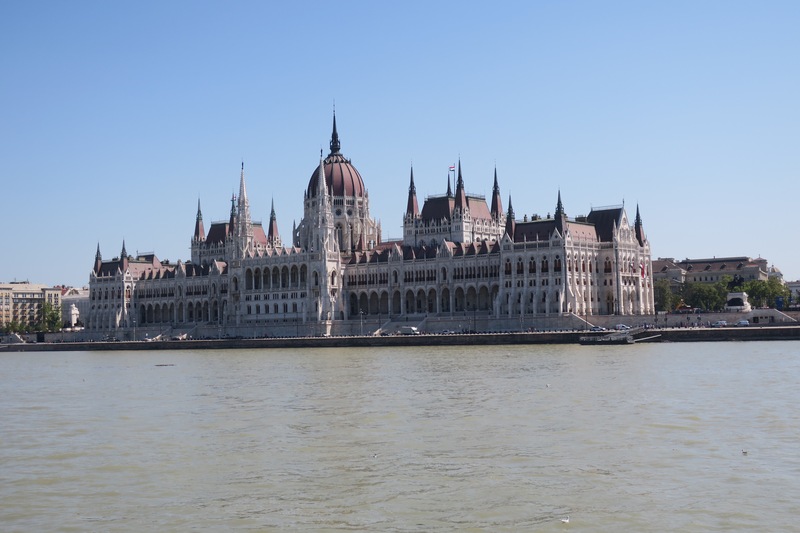 So glad we were able to make Hungary work on this trip! We didn’t think we would originally, but pushing it a few extra hours in our rental car was well worth the trip! 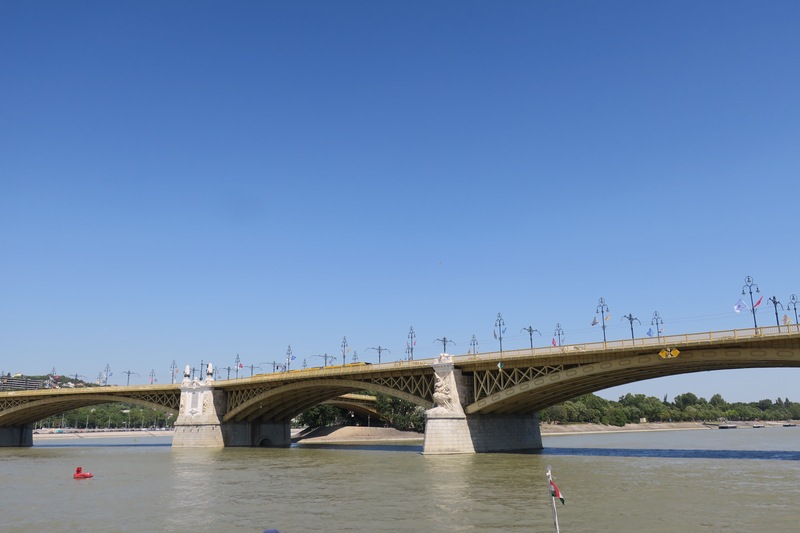 Soon after getting to our centrally located hotel, Ibis Budapest City, which we booked on Hotels.com through Ebates (click our link and make a purchase so we get credit!) 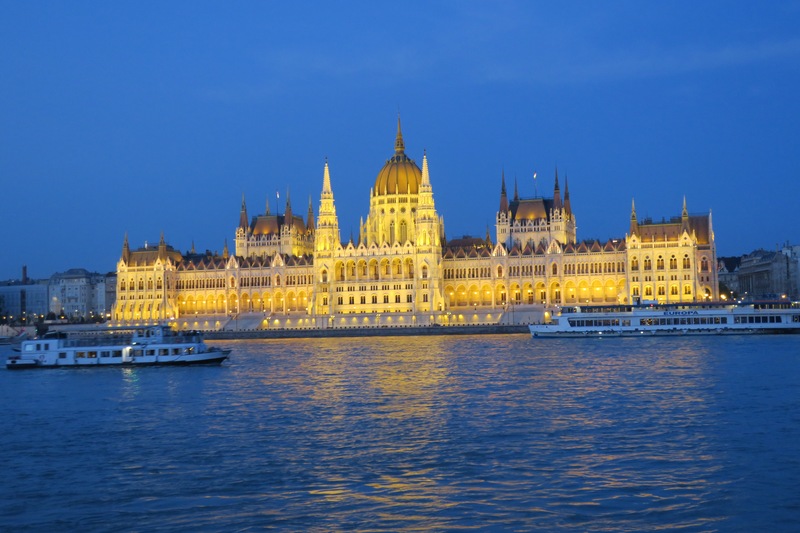 we satisfied one of our most important missions, to see the iconic Parliament building at night! 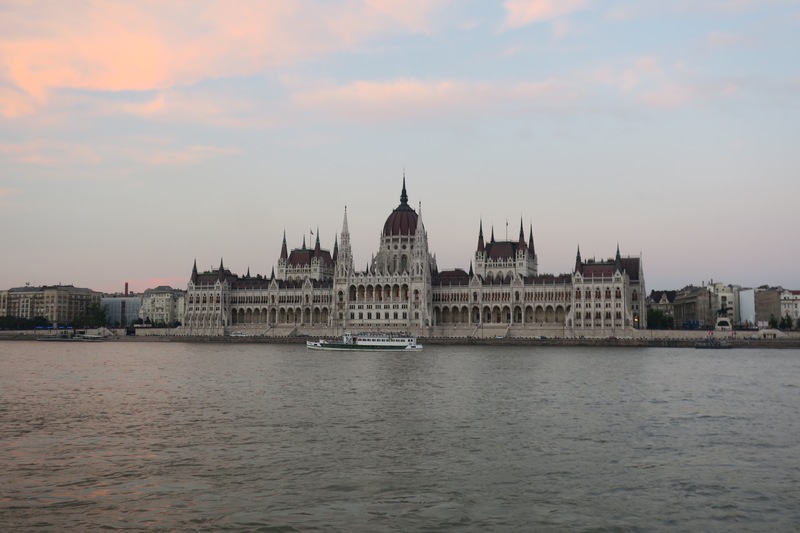 We traveled there during sunset and got some gorgeous photos of the colorful sky as well as evening photos of the Parliament building. 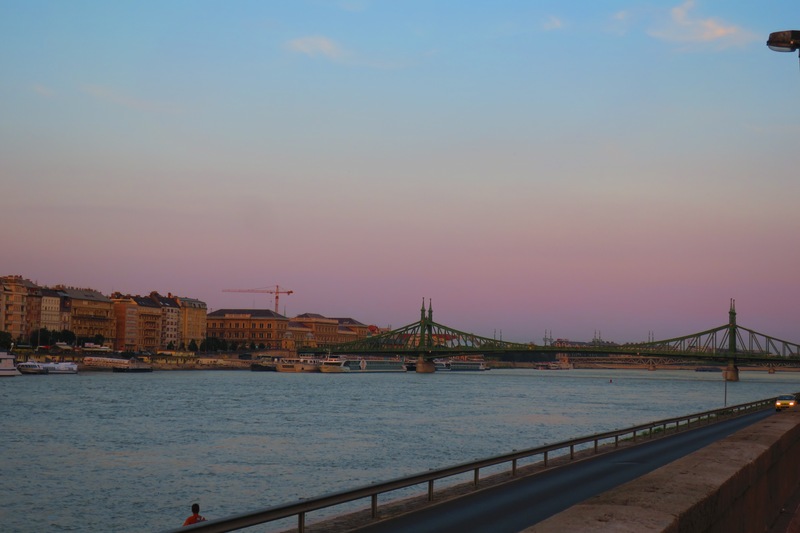 The sky and the evening transformed with each moment and we got the perfect view right over the Danube river. 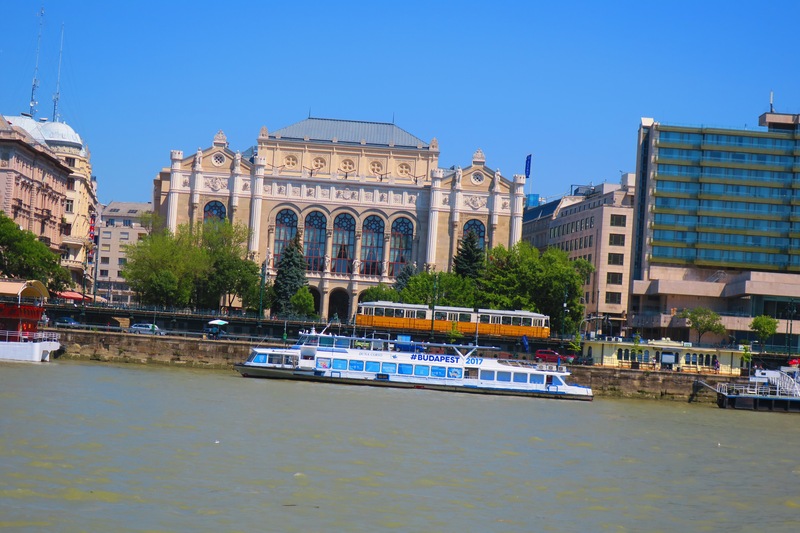 Not only were there trams, busses and a metro system to get us around the city, all of which were plentiful and punctual, but there was also a public boat that runs up and down the river. We thought it would be a fun way to see as much as we could while also being a smart way to get around in the hot weather! Boy, does that boat go far! It went, and went and went. 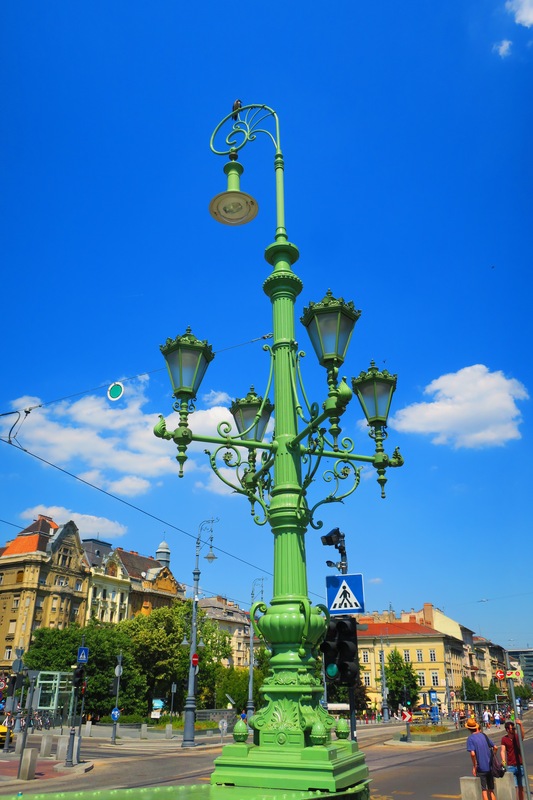 We thought it would be similar to the one in Brisbane Australia, a 30 minute trip, but no! We were on the boat for 2 full hours before it turned back around! A nice ride, especially since it was included in our €7/person 24 hour transport pass, but it was a little long and a tad boring at times. 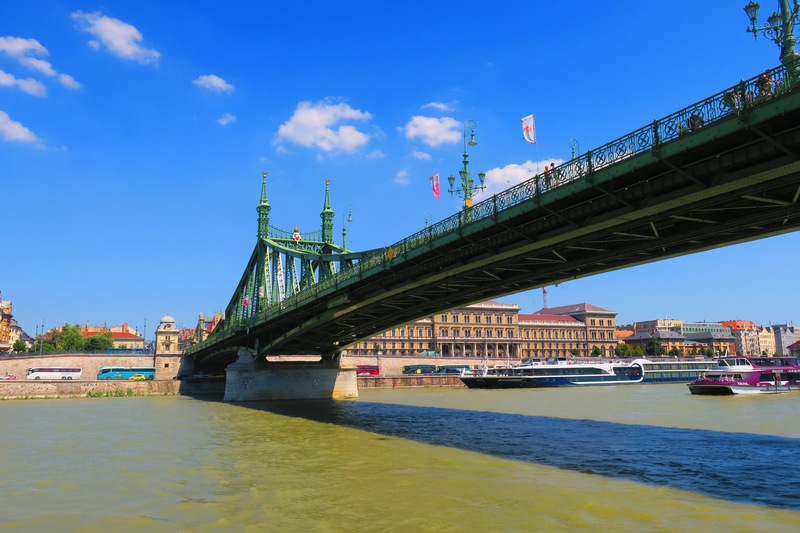 Our suggestion is if you want to use the boat as a sight seeing opportunity vs true point to point transportation, hop on at the Szent Gellert ter M stop (Under the famous Liberty bridge) and take it up to Margitsziget Centennial park. 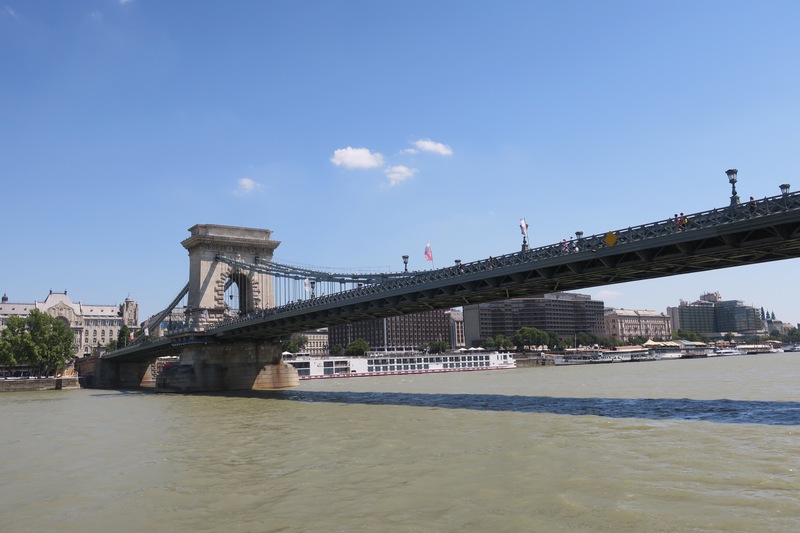 This route will give you all the best sights, from the famous bridges, to cruising by the parliament building to the centennial park where there is a huge Budapest sign, it’ll also save you hours of time. 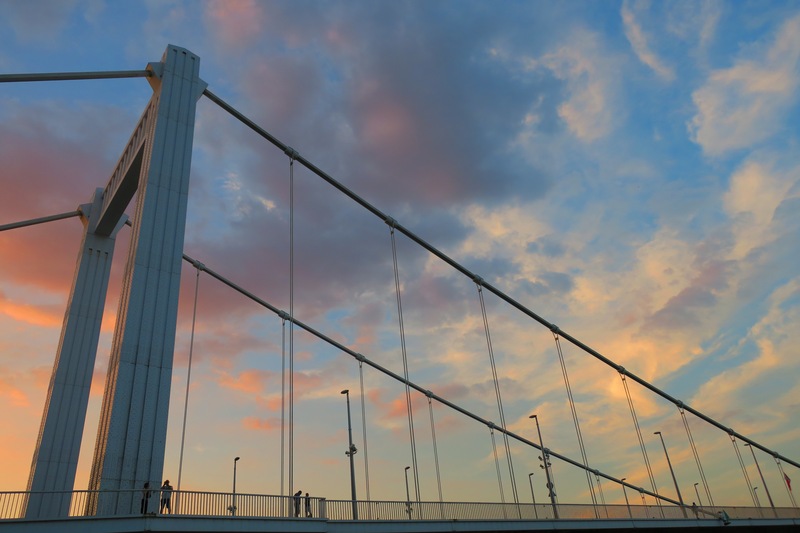 On the way back we hopped off the boat right at the famous green Liberty Bridge to snag some pictures. 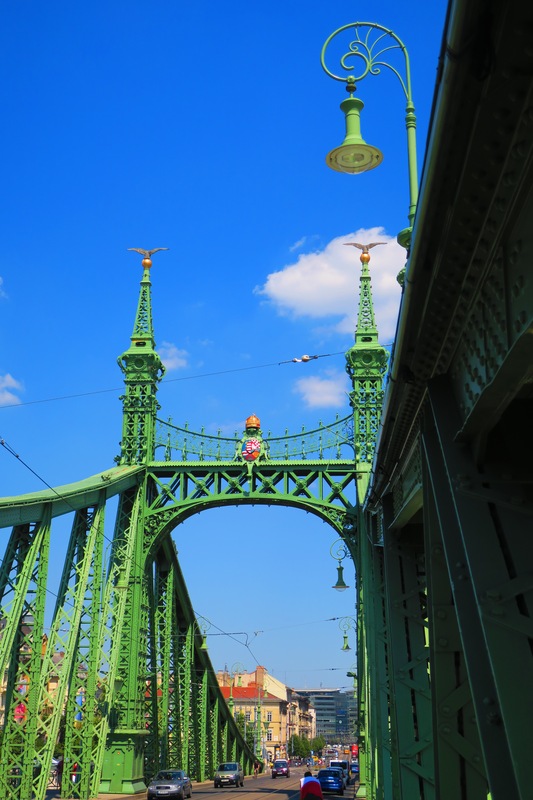 It was fun to walk along such a beautiful bridge with such history. 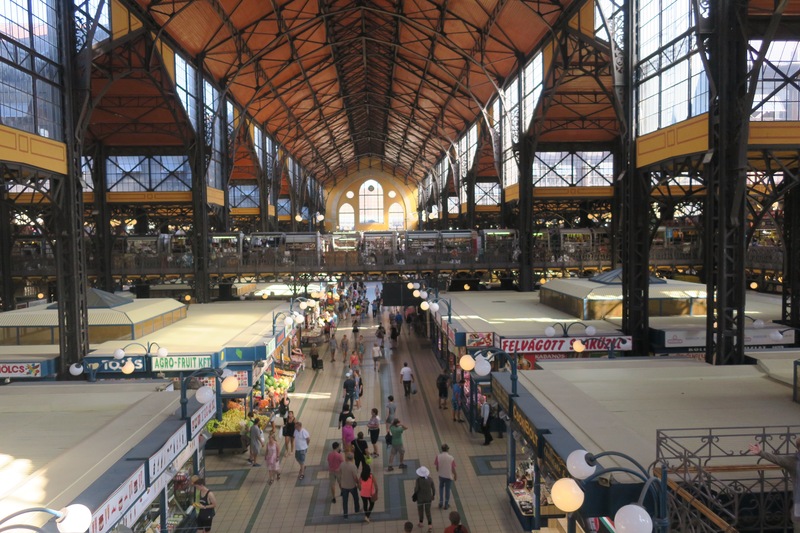 Close by there was the great Central Market Hall, a must do for anyone visiting! 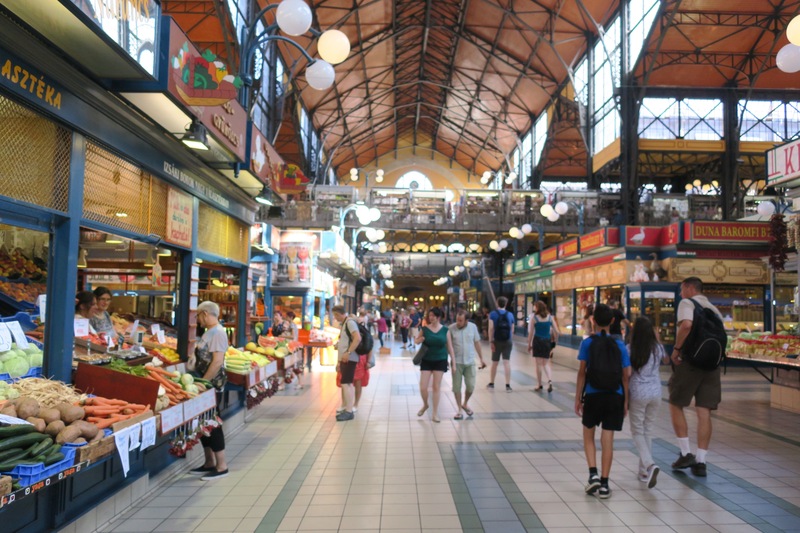 This is a great place to load up on both souvenirs and good eats! 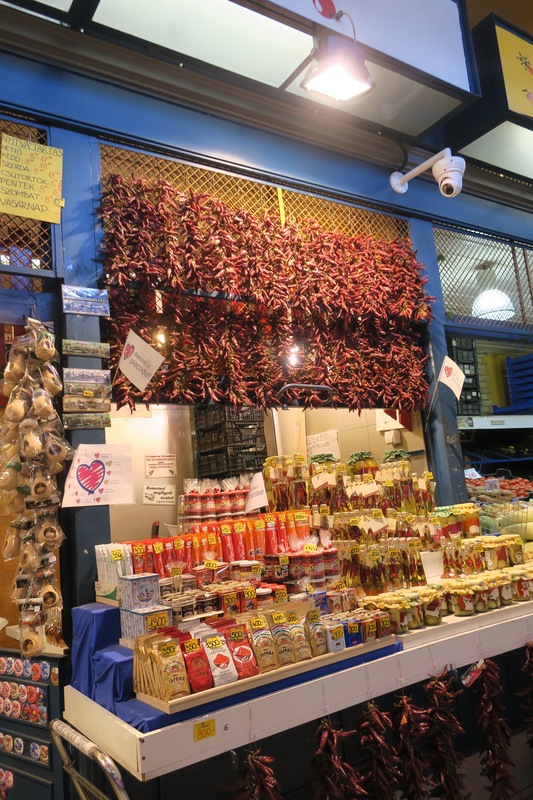 The first floor is filled with grocery needs, fresh fruits and vegetables, butchers, fish mongers and charcuterie (sausages), but the best part for us was the shops selling paprika! Being that Dean’s mother used to cook Chicken Paprikash (more on that later!) 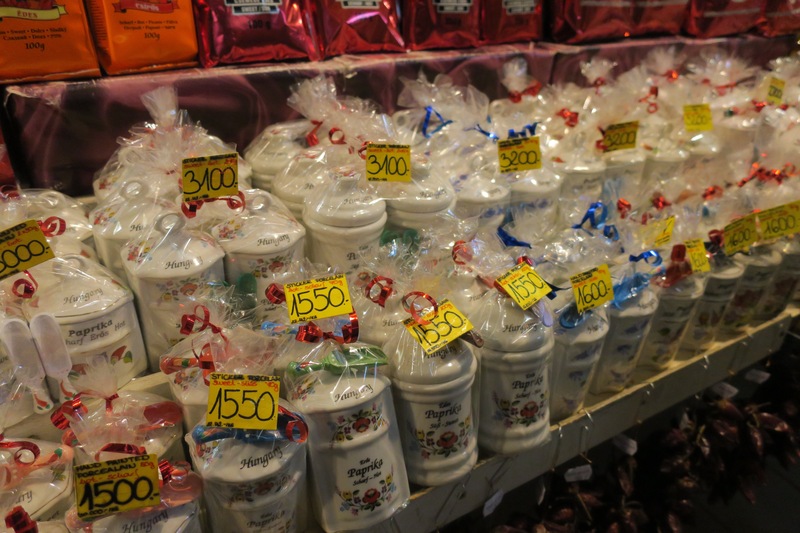 we wanted to pick up some authentic Hungarian paprika for both us and her. 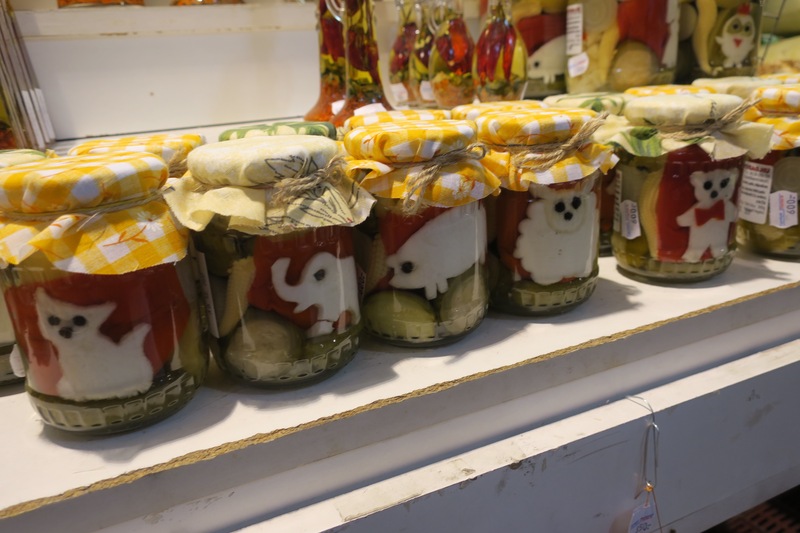 There are a few types of paprika that you can buy. There’s Sweet, hot and smoked, which can be either sweet or hot. We naturally needed to buy a some of each, and they even came in perfect little hand painted ceramic containers. So cute! 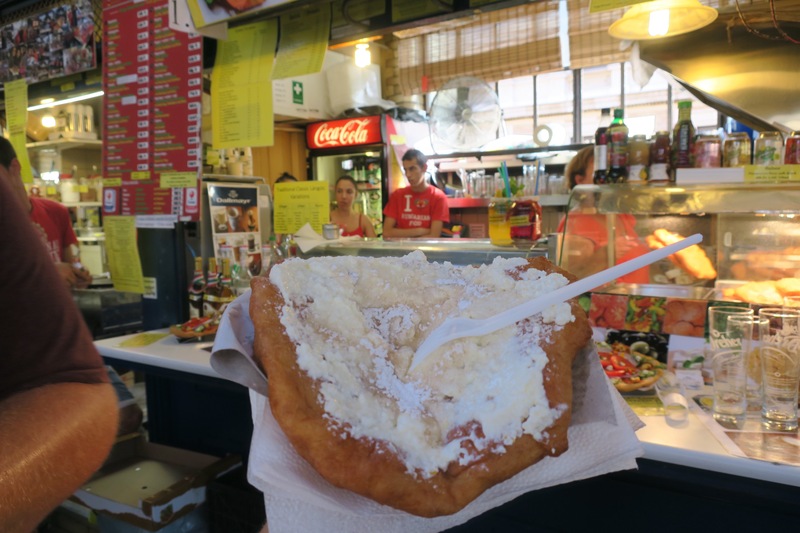 After purchasing our paprika we went upstairs to walk around all the souvenir shops and came across a booth selling Langos, a traditional Hungarian specialty. One of our loyal followers had told us to keep an eye out for it, so when we saw it, we had to try some! Langos is very similar to fry bread. 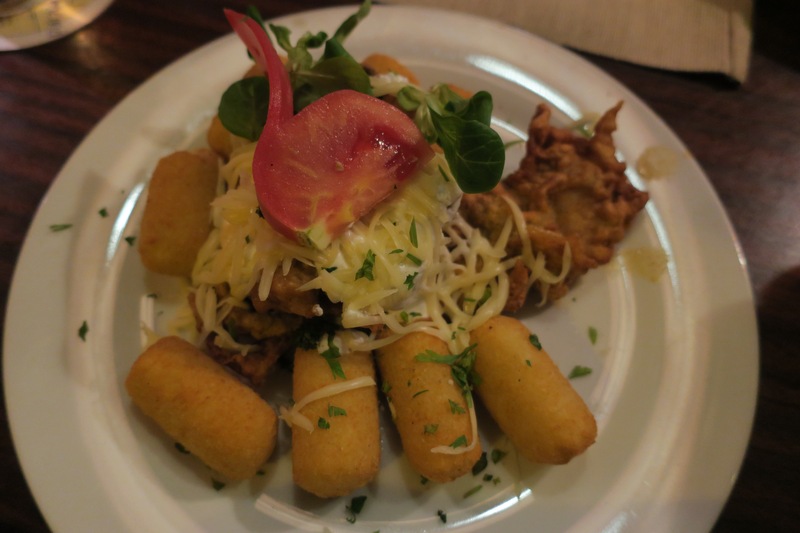 A heaping portion of dough deep fried and topped with pretty much anything you could ever want! 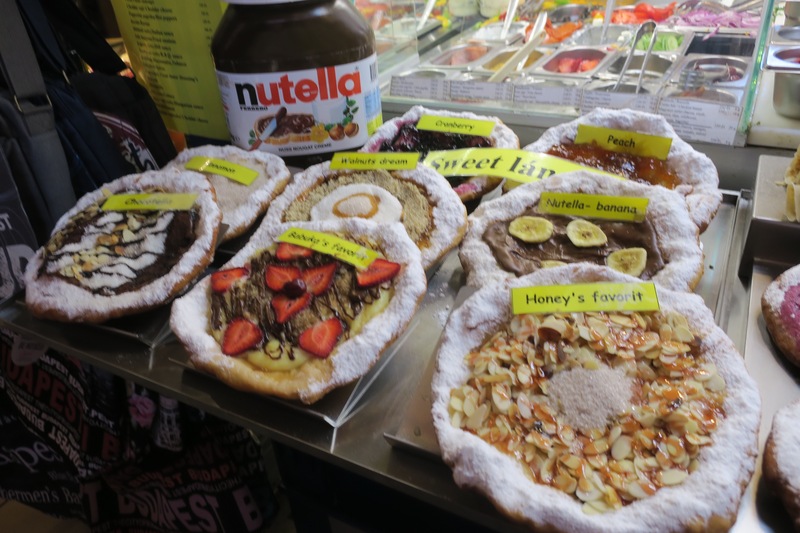 From savory options to sweet, there is something for everyone! We decided to get the sweet lemon variety which seemed to be a lemony ricotta type topping. It was the perfect mid day snack, and one was definitely enough for the two of us. Tourist beware, they know how to make their money! When they asked us if we wanted a dusting of cinnamon on top, we of course said, sure! Not thinking it would be extra. Wrong! They charged an extra $1 just for that! Lesson learned! 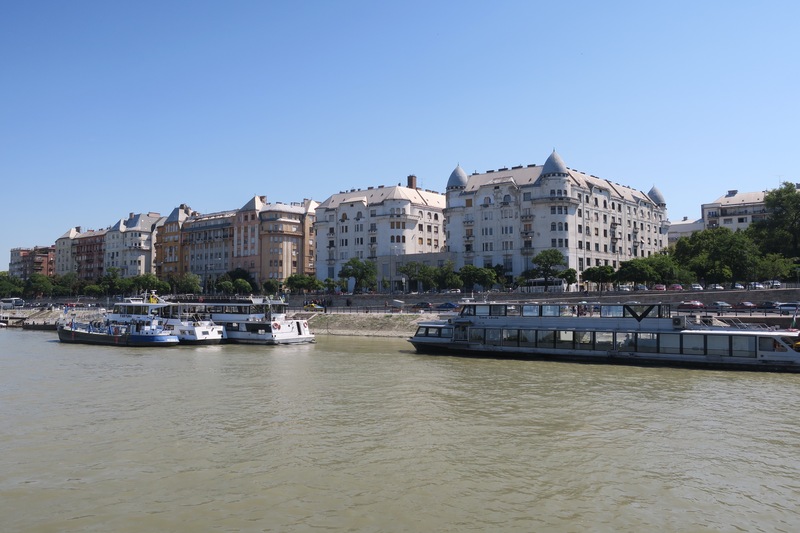 A big thing to do here is go to the famous thermal baths. Since we only had one full day, we couldn’t manage to fit it in, but we definitely have it on our list for next time! 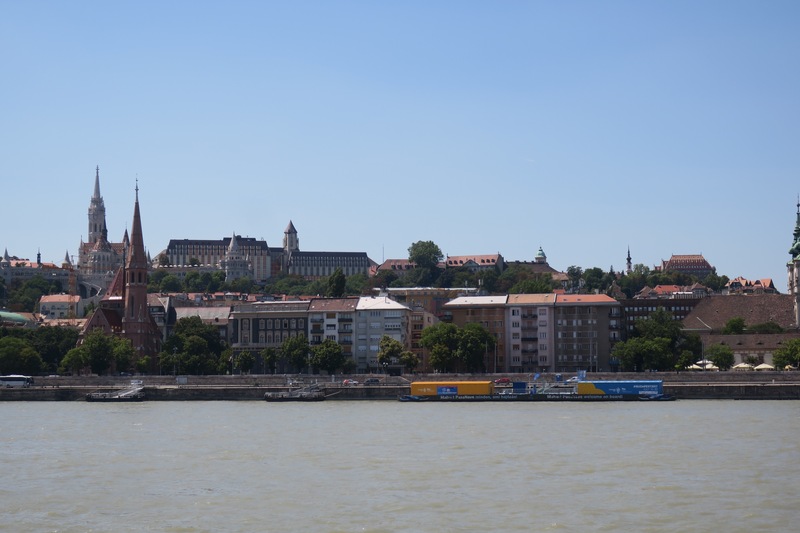 Fun fact: DO NOT clink your beer glasses in Hungary! Wine, cocktails, shots… all fine… no beer! 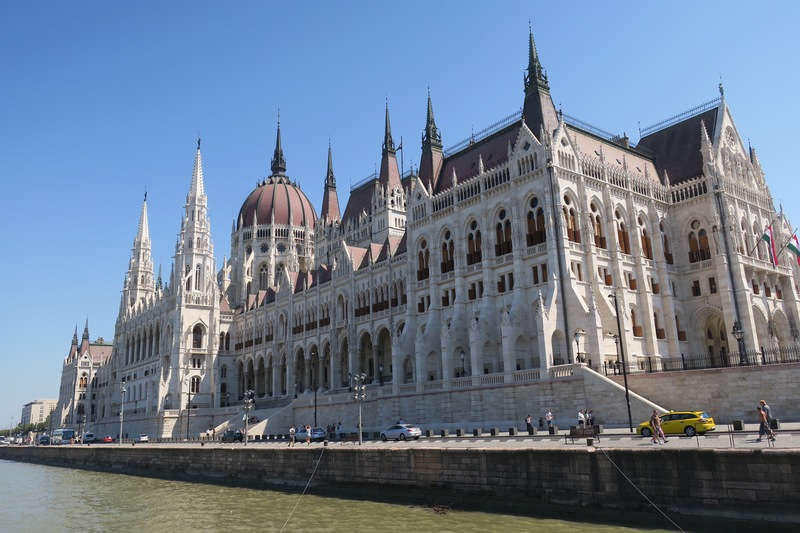 Legend has it, that when Hungary’s 1848 revolution against the Habsburgs was defeated, the Austrians celebrated in Vienna by toasting and clinking their beer glasses. 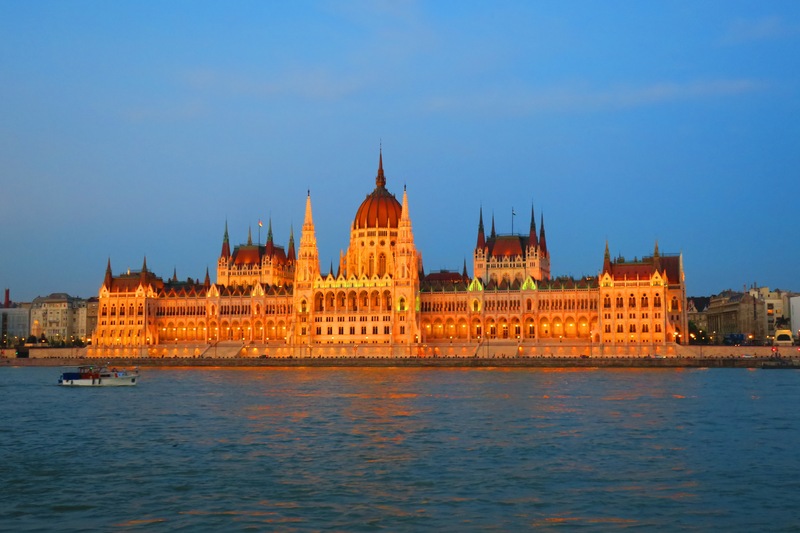 Hungarians vowed not to cheers with beer for 150 years. 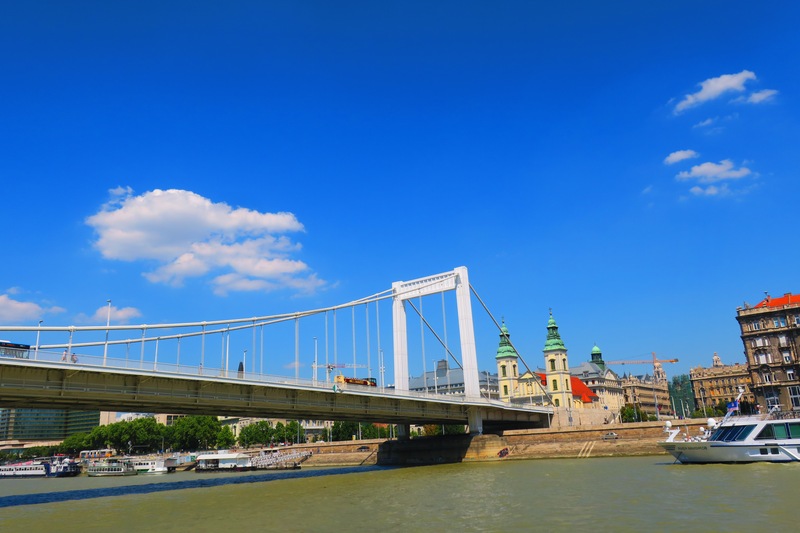 While that time frame is over – Hungarians still don’t ‘cheers’ with beer! 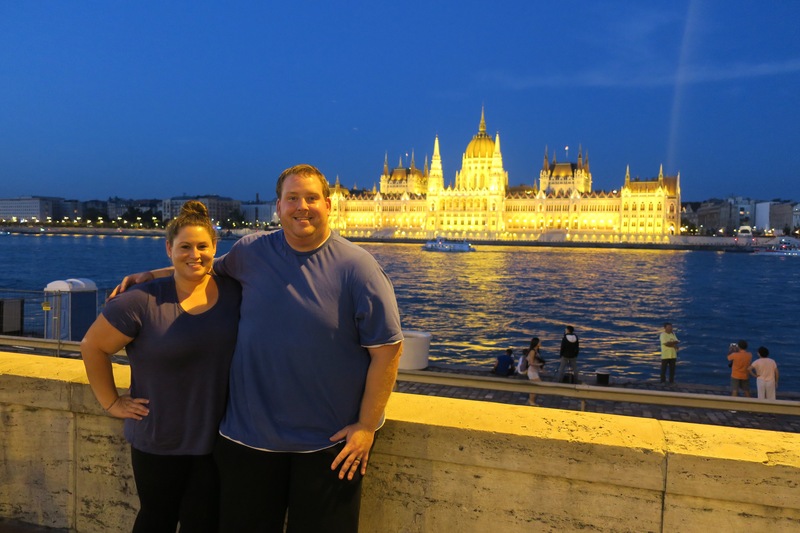 Bajor Sarok: Our first Hungarian meal definitely didn’t disappoint. First, beers (no we didn’t cheers)! 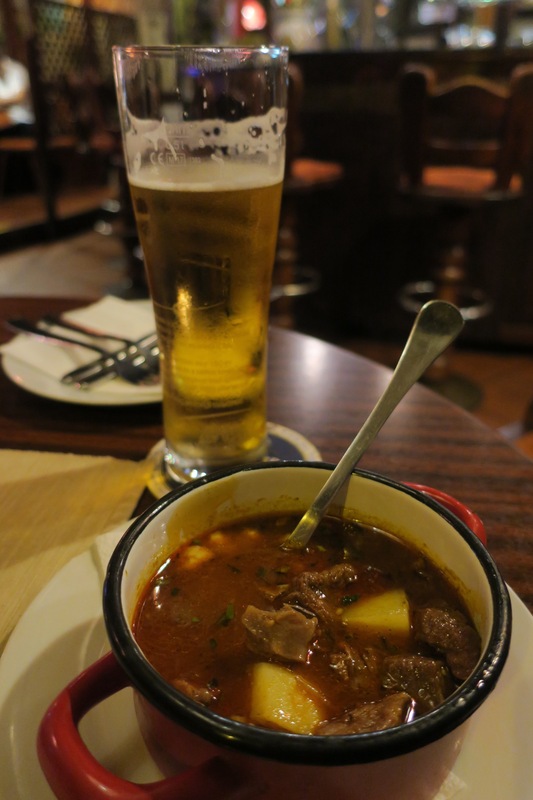 Next up we had to try the famous Hungarian Goulash. (Side note: Hungarian goulash is not a rich thick hearty stew as most might think, and definitely not a dish with macaroni and ground beef topped with cheese!) Rich paprika broth with tender beef, potatoes, parsley. Such intense Hungarian paprika flavor! Main meals consisted of fried chicken breast coated in sour cream and covered in shredded cheese for me with some potato croquettes too, yum! 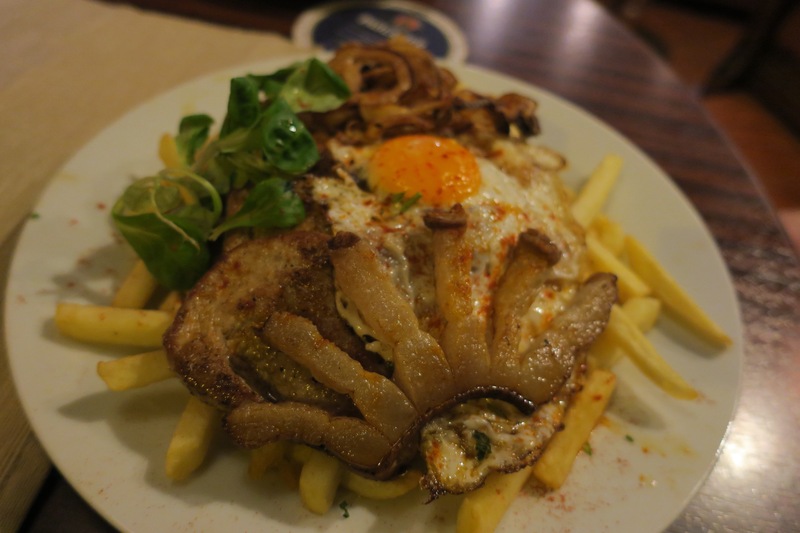 Dean got a Gypsy Steak which was a pan fried pork steak with crispy onion on top of french fries topped with a fried egg. They added a piece of back bacon both for our viewing pleasure and to taste, he loved it! 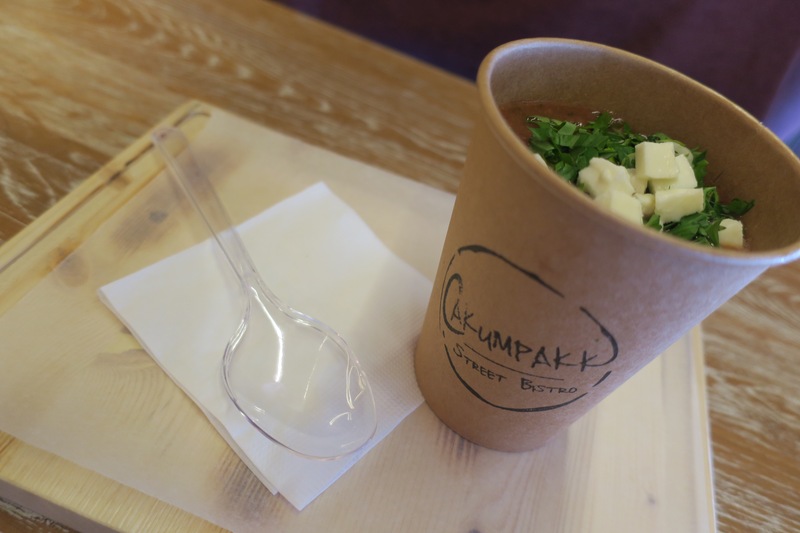 Cakumpakk: Hungary is big on soups, that is very clear! Hot or cold, any time of day. Our meal at Cakumpakk was no different. 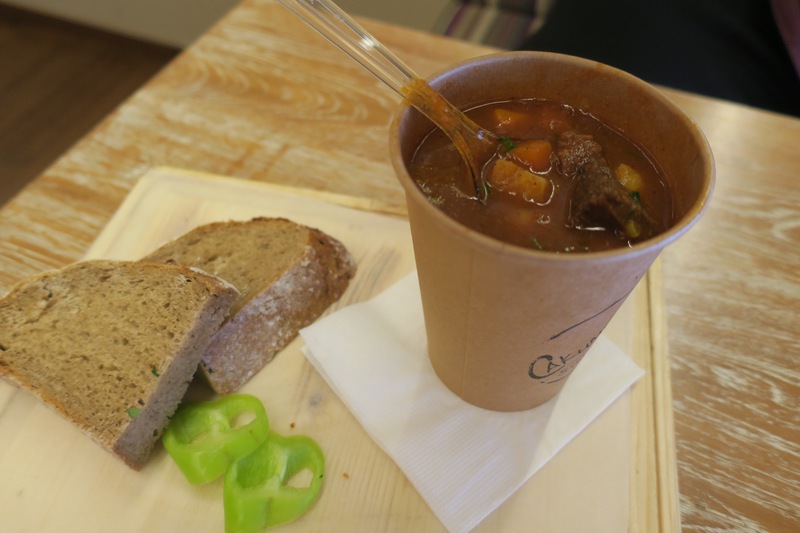 To start, we got their gazpacho, goulash (because yes, you have to try it at every opportunity!) and a cold creamy corn soup topped with cinnamon tossed popcorn and parsley. Both were insanely delicious! 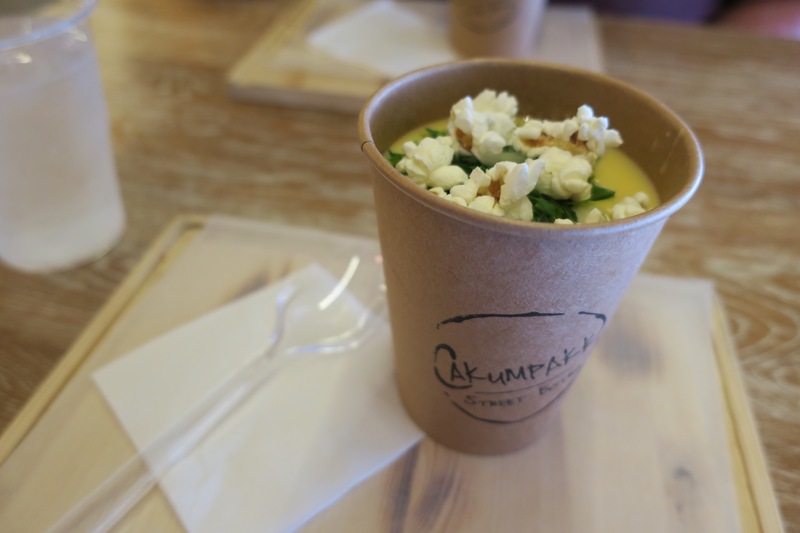 I wasn’t sure how I’d feel about a cold corn soup with popcorn but it was amazing! Super refreshing since it was so warm out and the texture was creamy with hints of crunch from the popcorn. The cinnamon took it to a whole new level! Definitely one we’ll have to recreate at home. 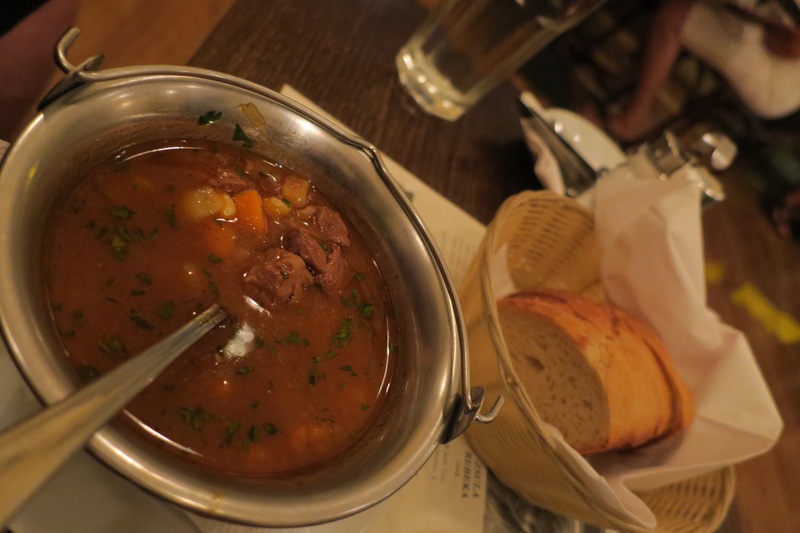 The goulash here was much thicker! Almost like they puréed all the vegetables together for the broth and added the beef in at the end. Much different than the one we had the night before but tasty in its own way. The gazpacho was just like any other, a nice refreshing taste of Hungarian tomatoes on a hot summer day. After our soups we shared Chicken Paprikash, the national dish of Hungary! Traditionally it is pieces of chicken in a creamy paprika sauce served with sour cream over a bed of small dumplings. Each restaurant seems to have its own spin! Here, the sauce was less creamy but had huge dollops of sour cream and was served over big “smoked” flour dumplings. Very filling! We were happy to share for sure. Lado Cafe: Our last night in Budapest we decided to go a little fancier than usual and not only did Lado Cafe have great reviews, but it was right around the corner from our hotel! The second we walked in our ears were filled with the sound of live jazz, our noses smelled the delicious homemade food and our sights filled with an older crowd dressed up for the night. While it wasn’t a vibe we usually go for, it set the scene for quite a nice night! 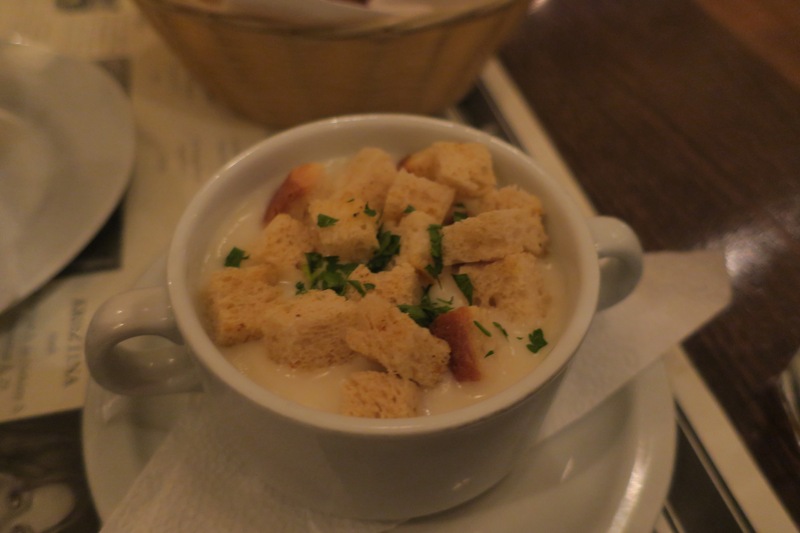 For starters, another variation on goulash for Dean and a creamy garlic soup for me. 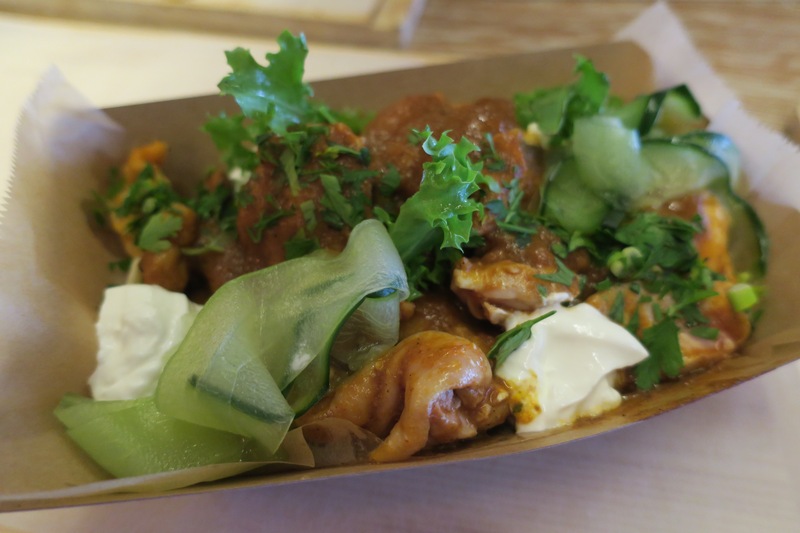 Dean’s goulash seemed to be a mix between the other two he had in Budapest. While the broth was thicker than the first place, it wasn’t quite as thick and stew like as the second. The flavor, however, stayed consistent with that kick of paprika! I was curious how my garlic soup would taste. 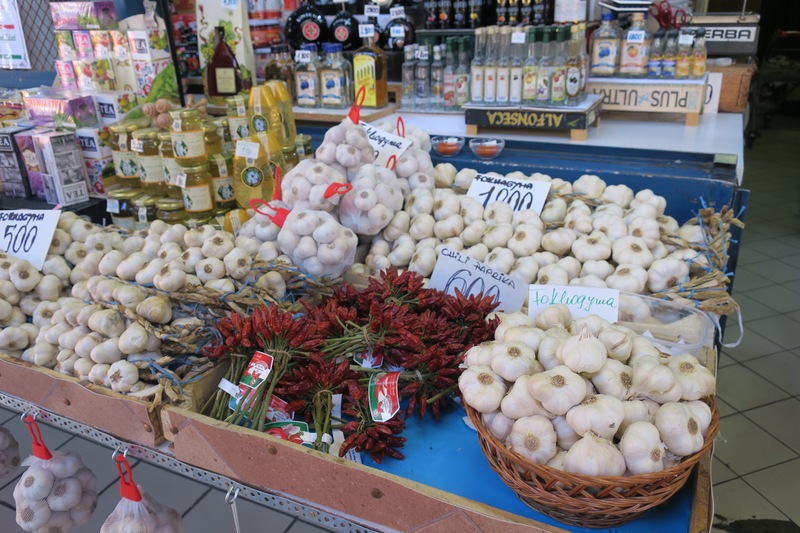 I love garlic but didn’t want it to punch me in the face too much! This soup had the perfect balance. A creamy, smooth consistency with just a hint of garlic…perfection! 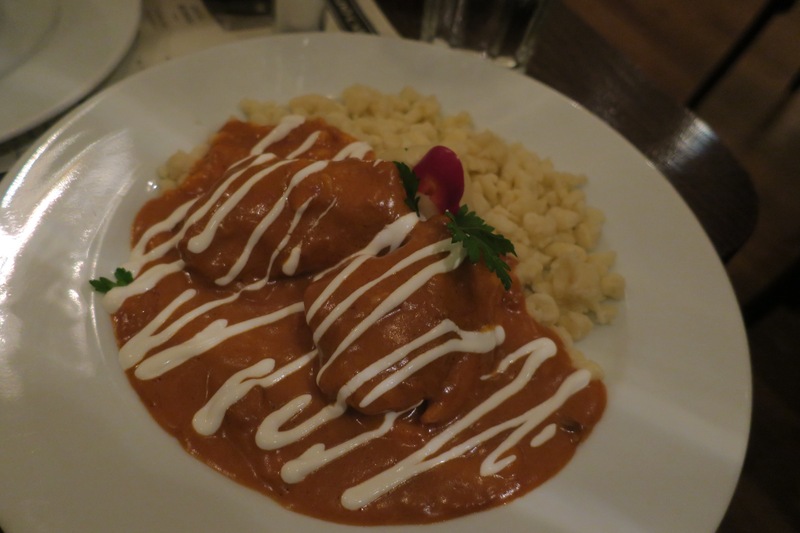 I knew I wanted to get Chicken Paprikash again to see how it would compare from the first time I tried it, and when it arrived at the table I knew immediately it was the right decision! The sauce was much creamier which is always better in my book. The chicken was extremely tender and the tiny dumplings were the perfect vessel for it all. I’m still drooling over it! Dean got Rakottkrumpli. While normally a dish best suited for winter and not a hot summers evening, it was great to try another Hungarian comfort food! A hearty serving of sliced potatoes on top of a bed of crumbled Hungarian paprika spiced sausage. 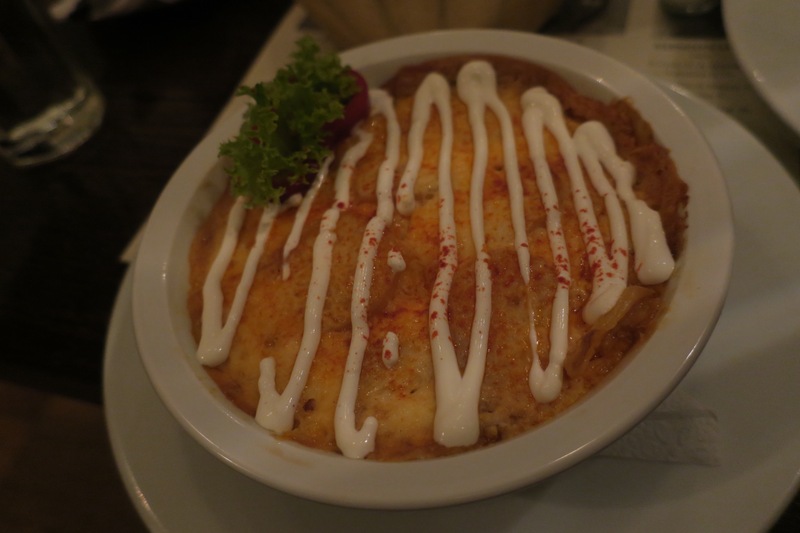 The whole thing was studded with hard boiled eggs and then topped with some sour cream and cheese and baked. Then, just as it’s served, more sour cream on top! While this dish would be right at home at a breakfast table, it was a great dinner and we can see how this would get you through a cold harsh Hungarian winter! 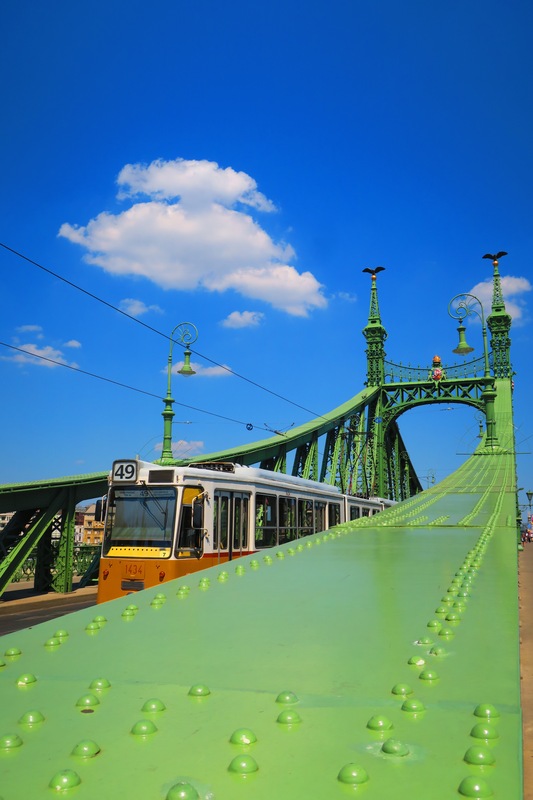 What a fantastic city! So much we didn’t get to see, but we’re so happy we got to do as much as we did. Next up on this part of our adventure is a breathtaking drive through Austria and Southern Germany! Looks to be an exciting city, the food must have been delish!